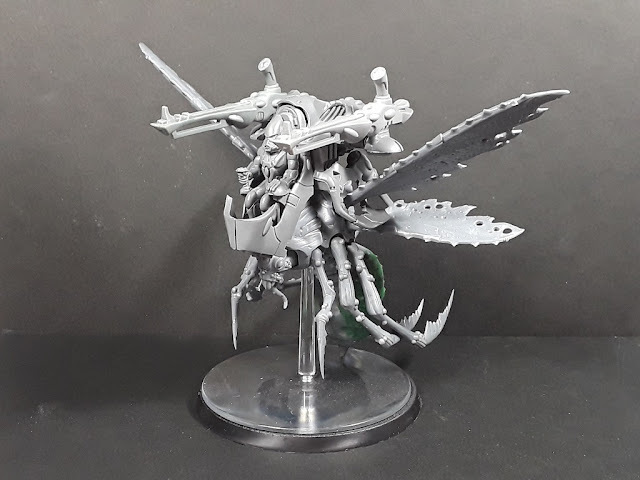 Mordian 7th Regiment: Exodite Eldar - Wasp Assault Walkers Built! Quick hit today, with the addition of a trio of new models for the Exodites - Counts-as Wasp Assault Walkers, using the Forge World rules. The initial intent was to use the Stormcast Vanguard Palladors to do jungle-cat-based War Walkers, but I just couldn't figure out a good combo of bits to make the combo work. So, inspired by a fellow Exodite builder on Instagram I utilized the Blight Drones instead, which in the end I think will tie out with the giant spider quite well. I used some greenstuff to fill in the more egregious open sores to de-Nurgle them a little, and the end result is both creepy and fitting! Once the first one was built, the following two just flew together (pun definitely intended)! Really looking forward to getting started on them, though a new project is also underway behind the scenes, following the successful sale of the Thousand Sons and Spireguard. Woohoo! Possibly! I may stick with the same color scheme as the spider (purple and unhealthy greenish skin) but have been scheming on adding some yellow striping to it and these as well! Another great conversion for the army. Loving how this force is coming together. Thanks very much! It's been a hoot smooshing the various kits together to see what works! Yasss! These are ace and fit in so wonderfully with the rest of your cool conversions. I second the yellow/black. Doubt a spider would have the same colouring as a wasp afterall. Cheers! That is a good point on the color schemes! I've run out of superlatives. I'm starting to get just plain jealous now.